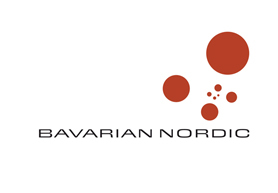 Bavarian Nordic is an international biotechnology company developing and manufacturing cancer immunotherapies and vaccines for infectious diseases. The company has it’s headquarter in Kvistgaard, Denmark, where it also operates a commercial-scale manufacturing facility. Research and development facilities are located in Mountain View, CA, USA and Martinsried, Germany. Bavarian Nordic is especially known for its smallpox and prostate cancer vaccines but with the resent Ebola outbreak, some of the focus has shifted to their phase 1 “MVA-BN Filo” Ebola vaccine. 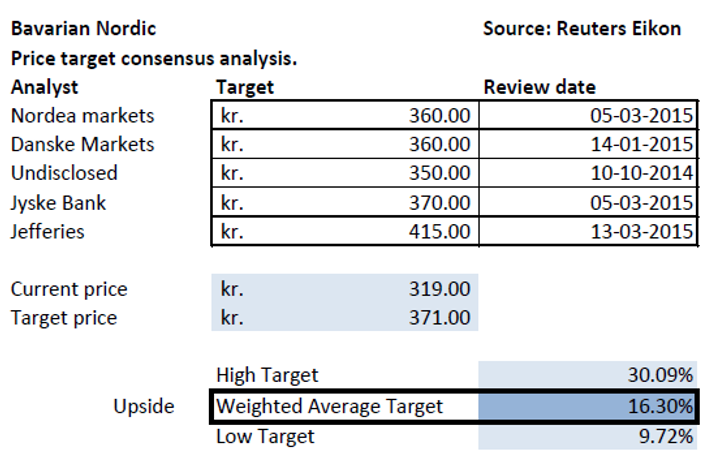 Based on the gathered analyst consensuses, the target price for Bavarian Nordic spans from a low of 350 and a high of 415, which indicates a consensus spread of 415-350 = 65. At the moment of analysis (11-03-15) the stock price is 319 indicating a positive attitude towards the future stock price of Bavarian Nordic from all the included analysts. Due to the consensus spread, the expected one year gain relative to today’s price ranges from 9.72% to 30.09% with a weighted average of 16.30%. In the above figure multiples for Bavarian Nordic and its peers is presented. Comparing multiples of Bavarian Nordic to its peers we find that Bavarian is relative inexpensive. The majority of Bavarian Nordics multiples are below the peer median and average. We find a price estimate of Bavarian Nordic by comparing the average of price per P/B within the peer with the P/B of Bavarian Nordic. The peer median of P/(P/B) is 52.34 and since Bavarian Nordic has a P/B of 9.44 we find the expected value of Bavarian Nordic to be 494.12 which indicates an upside of 55%. In the same fashion, we find a price estimate by using the peer median price of the current ratio between assets and liabilities. The median peer price to current ratio is 154.69 and since Bavarian Nordic has a Current Ratio of 2.30 the expected value is 357.82 indicating a upside of 12%. At the time of the initial analysis (10-02-15), the price was 180.50 DKK, which resulted in a buy recommendation from the investment panel. In the meantime, the news of the partnership between the American medical company Bristol-Myers Squibb and Bavarian Nordic gave a significant rise in the share price, which means that the price was 319 DKK when this article was written (11-03-15). This rise in the share price means that, we issue a hold recommendation because of the time lag from the initial valuation to the final analysis conducted for the article. To sum up we find that the analyst sentiment towards the Bavarian Nordic stock and the conducted peer analysis valuation was rather positive. Both the consensus and peer based analysis agrees on a positive upside with a price range from 371-494 DKK. Still we believe that the upside is not large enough in the lower end of the price range and therefore the Investment Panel Aarhus concludes and overall HOLD recommendation.